One of my favourite things to eat are meatballs. And while I love a traditional Italian-style meatball, I like to mix it up with meatballs from different parts of the world like these Moroccan meatballs, these Green ones or this giant meatball / meatloaf. My latest obsession are these Lebanese-ish ‘kofta’ (middle eastern meatballs) which were inspired by a recipe in the book ‘Honey & Co. – Food from the Middle East’ from the London based restaurant. This is my simplified version. Carraway seeds are a really underrated spice. I’ve been using them in my sauerkraut for ages and loved their fresh flavour but hadn’t really experimented with other cooking. Until these kofta. They go really well with beef but if you’re looking for more places to use your carraway seeds they’re also lovely with cabbage in any form. 1. Preheat your oven to 200C (400F). Combine beef and carraway seeds in a medium bowl and season generously with salt and pepper. Scoop tablespoons of the beef mixture and roll into meatballs. Place meatballs in an oven proof dish large enough to hold them in a single layer. 2. Roast meatballs for about 20 minutes or until well browned and cooked through. 3. While the meatballs are cooking combine tahini and yoghurt in a medium bowl. Smash garlic (if using) and chop as finely as you can and add to the tahini yoghurt sauce. 4. To serve, spread yoghurt tahini sauce over two plates. Top with meatballs and coriander leaves. 5-ingredients – skip the garlic. vegetarian – add carraway seeds to these lentil balls. no carraway seeds – just skip it or use 1 teaspoon cumin seeds and 1 teaspoon ground coriander instead. more substantial / carb-lovers – serve with warm pita or other flat bread or tortillas. Or serve meatballs on a bed of creamy mashed potatoes. no tahini – either replace with mayo to make a yoghurt mayo sauce or just use extra yoghurt. Or use hummus instead of both the yoghurt and tahini. For more ideas to use tahini see here. more veg – the guys from Honey & Co serve their kofta on a bed of roast veg including onion, eggplant and capsicum (bell peppers). They toss in some cooked white beans as well. no coriander / cilantro – flat leaf parsley or mint will work. Or use baby spinach or other salad leaves. A shaved cabbage salad would also be a lovely accompaniment. 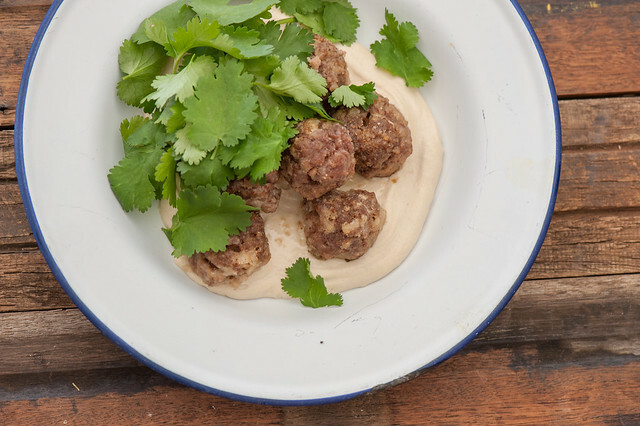 short on time – skip rolling the beef into meatballs and just brown in a pan with the carraway seeds and serve the spiced beef on top of the tahini yoghurt sauce.